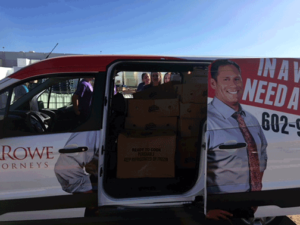 Lerner and Rowe kicks off the holiday season by giving the Phoenix Rescue Mission 600 frozen turkeys this past Saturday to fill the bellies of Phoenix families on Thanksgiving. 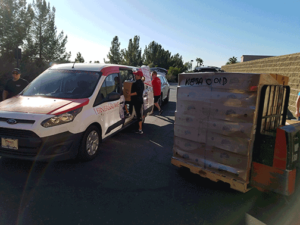 We are so fortunate to be part of a community that cares and that gives back to help our fellow neighbors in need. 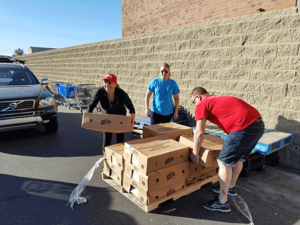 The Phoenix Rescue Mission is doing great things for the local community to ensure that many families have food on their tables over the holidays. 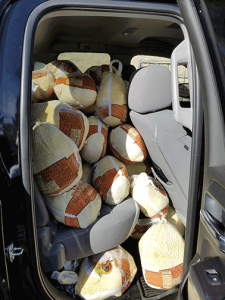 Drop off a frozen turkey at the the Mission’s Community Solutions Center located at 1801 S. 35th Ave. Fill a box with non-perishable Thanksgiving sides for a disadvantaged family to use to make Thanksgiving dinner in their own home. Decorations and notes of encouragement and best wishes are also welcome “sides” to include in the box. These boxes will be distributed on the Saturday before Thanksgiving so donations need to be to the Mission by Friday, November 17th. Donate $1.92 to the Mission to provide someone with a hot Thanksgiving dinner at Phoenix Rescue Mission.